So, here’s me thinking I know a bit about Spanish wine (and I do too), but my knowledge, expertise and experience over the last 21 years, practically pales into insignificance when compared with the latest book by my colleague and friend, Sara Jane Evans MW! Approximately twenty years ago I had in my hands a contract to write an introductory book on the Wines of Spain. It was quite an accolade and I was keen to write a first reference book after so many articles. However, it was an opportunity I had to turn down – the sheer scale of the undertaking had me almost shaking with trepidation! Since then, considering all the publications for which I’ve written, it must now be well over a million words, almost always, in praise of Spanish wines – describing them, their provenance, their producers et al. So, I’m now in an even better position to understand how huge and difficult such a project would be! Sarah Jane Evans MW, is also aware of how vast an enterprise, having decided to write it in two different parts, however she didn’t baulk at the task, she just got on with it! Of course, as a Master of Wine (MW), who specialises in Spanish wines, Sarah Jane Evans would be by far the better option as a writer for such a reference book, and this clearly comes out when reading it. It seems there is nothing that has been left out, and it’s clear that she writes from great knowledge and experience. And that’s not surprising! The author is an award-winning wine writer, journalist and speaker at conferences worldwide. She co-Chairs the prestigious Decanter World Wine Awards; she qualified as an MW in 2006, and was presented with an award for the highest mark in the theory section of this exacting exam, and was subsequently appointed Chairman of the Institute of Masters of Wine! With regard to her specialist subject, Spanish Wine, Sarah Jane Evans was made a member of the exceedingly prestigious Gran Orden de Caballeros de Vino in 2010, with a number of similarly impressive appointments to various Denominaciónes de Origen throughout Spain. A Spanish wine expert, she certainly is! And one would need to be, in order to write this comprehensive book in such depth. However, this is certainly not just a factual reference book destined to gather dust on the library shelf. 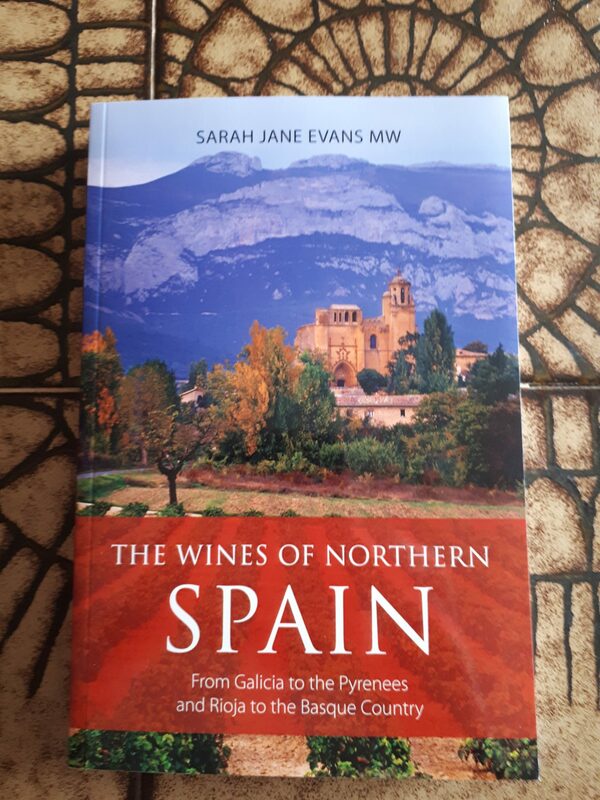 Sarah Jane’s writing skills, allied to her knowledge and personal experience of Spanish wines make, ‘The Wines of Northern Spain’, interspersed as it is with entertaining anecdotes and producer profiles, a thoroughly good read! The book, as the title would suggest, deals with the wine producing areas of Northern Spain, defined here in practical terms as: drawing ‘a line from the Pyrenees to Aragón and Navarra, turning west to Rioja, Ribera del Duero, Castilla y León, and Galicia, also taking in Txakoli country, and Asturias’. The early chapter, ‘Three Thousand Years of History’ gives a fascinating, historical perspective to these often ancient areas of production, and a useful backdrop to the areas and their wines as they are now. How interesting to know, for example, that the Phoenicians who were trading with Spain in about 1100 BC, bringing with them wine in amphorae, have left a legacy which has recently been revived here, where a number of bodegas are now using clay pots for fermentation and ageing wine! As the reader reads on he/she will find region, area and producer profiles (including climates, microclimates, soil types and altitudes), detailing wine making methods, varieties used and even some of the wines themselves. It’s a good read from cover to cover, and can then be used over and over again to dip into for reference purposes when readers are thinking of looking for new wine tastes and aromas and/or exploring the regions first hand. Christmas Present for Lovers of Spanish Wines! So, here’s me thinking I know a bit about Spanish wine (and I do, too), but my knowledge, expertise and experience over the last 21 years, practically pales into insignificance when compared with the latest book by my colleague and friend, Sara Jane Evans MW! Clearly, there is quality wine in the areas detailed in ‘The Wines of Northern Spain’, some of which readers will have tasted, however there are areas here that are less well known, whose wines are not so readily available on the Costas of Spain. We are therefore given an insight into what else there is to taste, which fits perfectly with Sarah Jane’s stated intention that readers should discover and taste these wines for themselves! 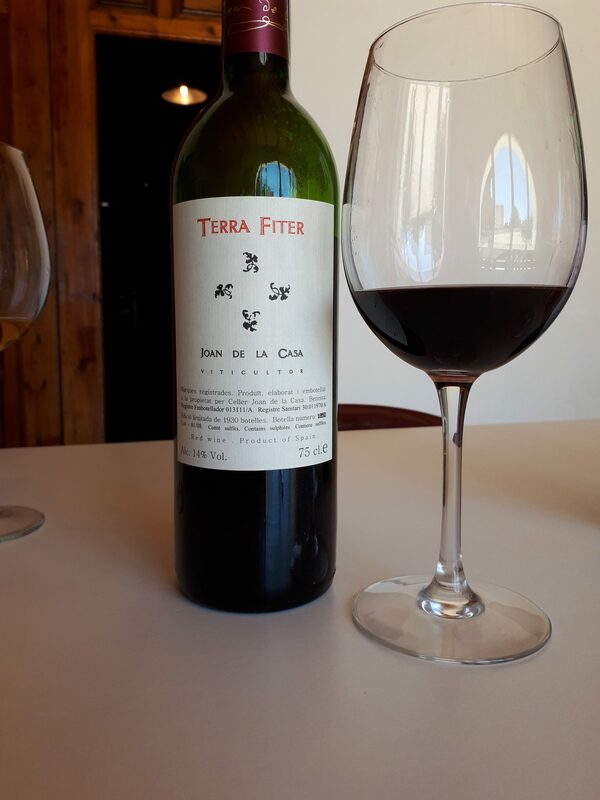 Author ColinPosted on November 30, 2018 Categories ArticlesTags Aragón, Asturias’, Castilla y León, Galicia, Navarra, Pyrenees, Ribera del Duero, rioja, Sarah Jane Evans MW, Spanish Wine, Txakoli, www.infideas.comLeave a comment on Christmas Present for Lovers of Spanish Wines! 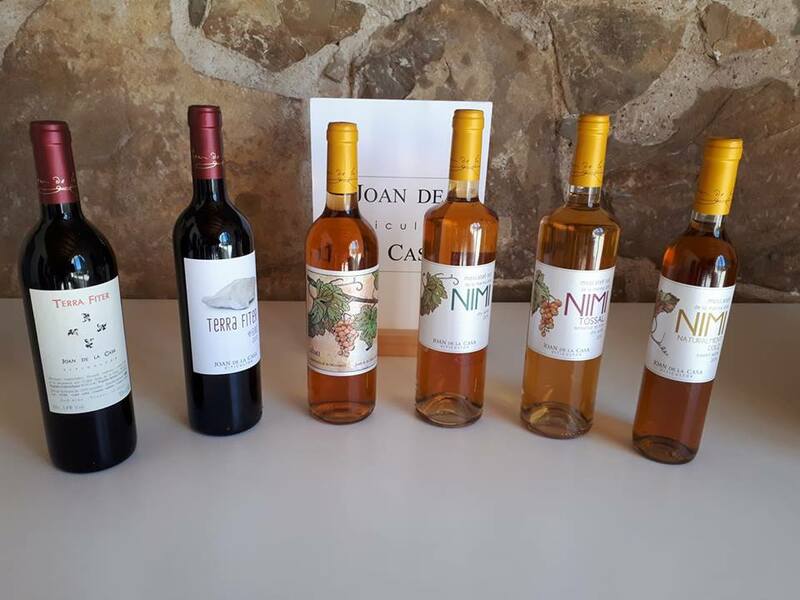 My recent discourse about the ‘Orange Wines’ of bodegas Joan de la Casa (www.joandelacasa.com/en/) provoked a number of comments and questions from readers (you can always e-mail me with yours – colin@colinharknessonwine.com). In the article I also alluded to his red wines. I’ve often said that wine is all the better for it also having a story attached – and so it is in this case. This morning I’ve been chatting with a vineyard worker in Jalón valley about the apparently on-going Garnacha/Giró confusion/debate (though, mostly concerning the vine that takes centre stage on my current, bite-sized Blog ‘A Season in the Life of a Vine’ seen here: [www.colinharknessonwine.com click Blog) . Let me explain: Giró is a black grape variety prevalent in the Jalón area, and in Alicante in general. However, there are those who say that it is just another name for Garnacha, the Spanish variety, called Grenache in France – a rose by any other name would smell as sweet! A trawl through Google, won’t particularly help here, and anyway, as a romantic by nature, I prefer the story that is attached to the Giró variety, which I believe, on balance, is in fact a wholly different grape. I’m not sure when, but let’s say several hundred years ago, the King (I’m not sure which but . . . . ) whose domain included what we now know as Cataluña as well as Las Islas Baleares was concerned that the farms of the latter were not being properly attended because of a drop in the population. In order to address the situation, by way of inducement, he offered free land to people willing to move there and look after his estates as well as the new land that they would own. The incentive was taken up – with several taking vines with them. Fast forward (I’m not sure how many years . . . ) and some of the ancestors of those who’d taken ‘the King’s shilling’ decided that they’d move back to mainland Spain, though further south, in order to requisition land that had belonged to the now banished Moors. Some arrived in the Jalón area, and, yes, they brought with them some vines to plant here! Now, whether the Giró that they planted was a vine that was originally indigenous to the Balearic Islands, uprooted and brought to the mainland; or if it was a hybrid, perhaps developing naturally from Garnacha, or maybe with the help of human hands, I’m not sure (as you might guess from the above!) – but no matter, it’s a good story and certainly fits with the absolute conviction of Joan de la Casa, that Giró is not Garnacha! Whilst Joan’s ‘Orange Wines’ are all made entirely with Moscatel, Giró figures highly in his reds, but not exclusively. 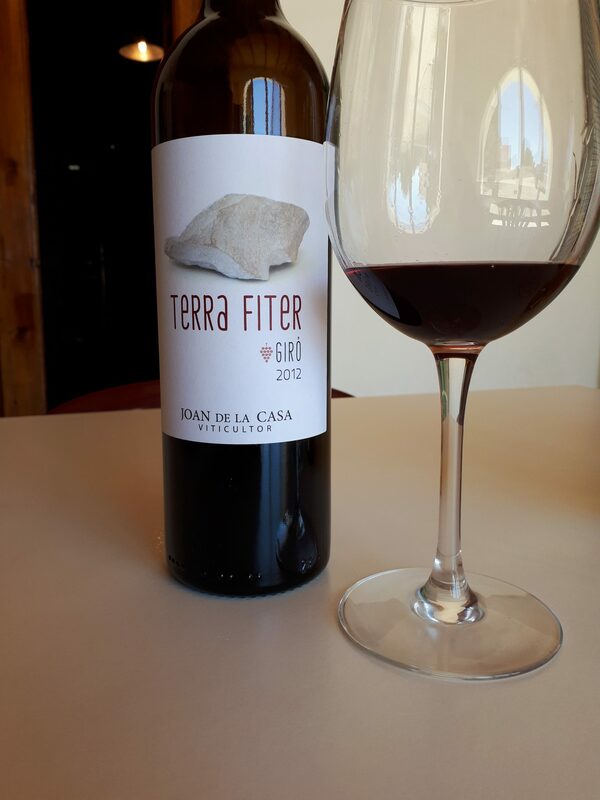 Terra Fiter 2012 (the latter a Valenciano word for stones, therefore stone strewed soils) is made with 100% Giró, harvested from 60 – 80 yrs old vines. The juice macerates for 15 – 20 days and is then transferred to oxygen-free sealed deposits – few yeasts can survive without oxygen, the natural yeast found on Joan’s vines, can, so it’s a natural selection of yeast that turns the juice into wine! This is a fruity wine, with fresh acidity, though five years old now, with balsamic notes and alluring blackberry fruit. Joan reckons it has three more good years, I’d say perhaps a year less – though certainly drinking well right now! 10€. A great night in a venue we have not been to before, but we will again ! A suggestion* …. 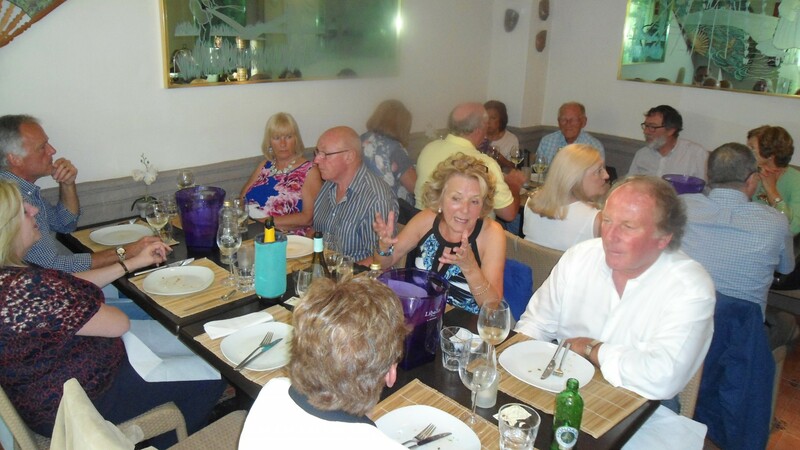 it would be great to have a note of the wines perhaps with your tasting notes and also names of the dishes sampled. *Thanks Jerry – all suggestions welcome!